Fly By Night is a dress inspired by bats, designed to show off your love for our nocturnal flying friends. The tight mini dress forms a dark silhouette as the background for the flare of bats, for the shapes of twists and turns, for the silent wings in the night. The full moon illuminates their flight, marking you as one of their kin. Come join the cloud and swarm the sky! 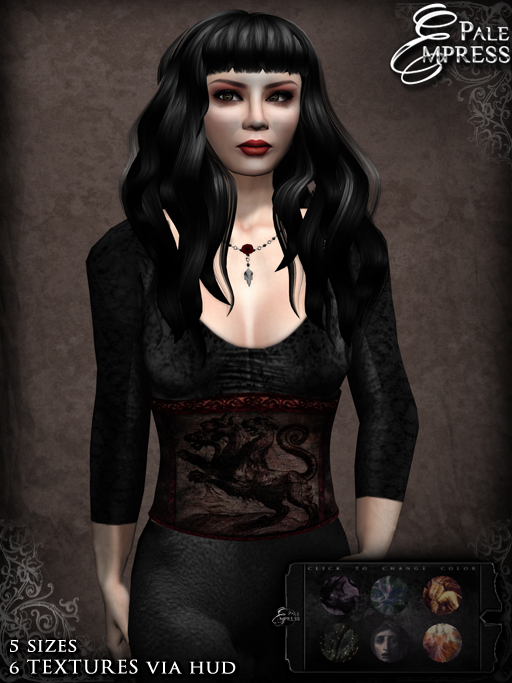 The dress is created for an event called The Truth About Bats and Avies, organized by slGoth Magazine. The charity is Bat World Sanctuary and the whole event will be delightfully bat-themed. The midnight blue charity version of the dress is sold for 99L, all proceeds go straight to charity. There is also a colour-change HUD version available for 295L. The HUD has twelve different colours, giving you practically a fatpack of dresses at the price of one! The dress is a rigged mesh item that moves with your avatar. It comes in the five standard sizes and is materials enabled. Please try the demo. Please note that the texture-change script will make the dresses appear no-mod in inventory, but they are as modifiable as rigged mesh can be: if you wish to tint them, you absolutely can. Permissions are M/C/NT. L99 for the charity version, L295 for the regular HUD-release. 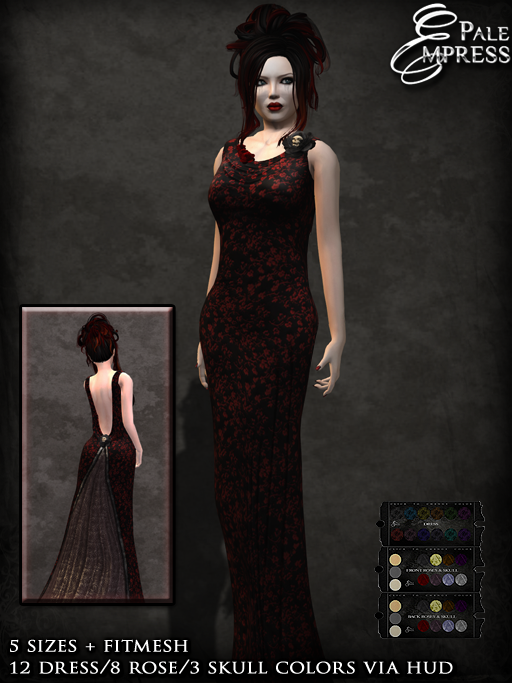 Nevermore is an elegant goth gown of sophisticated silhouette and dark decor. The top bares shoulders in a teasing manner, drawing the gaze into the raven skull in the center. The gemstones ornamenting both the front and the back of the dress are shrouded in shadows, forming intriguing shapes on your body. This is the gown for the queens of the night, for the sleek and stark and stunning. The dress comes with a colour-change HUD for both the skull and the dress. The dress HUD has eight colours and the skull HUD has eight colours for the eyes and three for the bone. This gives you practically a full fatpack of dresses at the price of one! The dress is a rigged mesh item that moves with your avatar. It comes in the five standard sizes. The raven skulls are separate, unrigged items. You can choose whether you want to wear them or not, and resize and reposition them as you wish. They appear no-mod in inventory because of the colour-change script, but they are perfectly modifiable. Materials ready textures. Please try the demo. Originally released at World Goth Fair 2015, now available in the main store and the Marketplace. The event exclusive versions are not available anymore. Patricia is a short-cropped jacket of sharp attitude. The raised collar transforms into a tempting cleavage cut, closed with button details. The form-hugging black top underneath the jacket brings focus both to the revealed abdomen and the emphasized curve of your bosom. This is the jacket for bold women dancing on the line of casual goth and a more fierce look on life. There’s a colour-change HUD of twelve colours included with the jacket, so you’re actually getting a whole pack of jackets at the price of one! The jacket is a rigged mesh item that moves with your avatar. It comes in the five standard sizes. Please try the demo. Cemetery Tears is a sleek gothic dress for date nights, official occasions or simply for those moments when you wish to wrap yourself in dark sophistication. The flattering silhouette becomes truly stunning at the back where the fabric is draped low to reveal and frame the line of your spine, emphasized with the rose and skull at the end. The dark underskirt flares out for easier movement while the front still holds together the sharp shape. The skulls on the roses add the definite goth touch to the aesthetic, making this dress an absolute must in any goth’s wardrobe. There’s a colour-change HUD included that allows you to control the dress, roses and the skulls separately: twelve colours for the dress, eight for the roses and three for the skulls. You’re actually getting a whole pack of dresses at the price of one! The dress is a rigged mesh item that moves with your avatar. It comes in the five standard sizes and a fitmesh size. The roses with skulls are separate, unrigged items. You can choose whether you want to wear them or not, and resize and reposition them as you wish. Please try the demo. Charlotte carries a subtle edge within her poise. The heavy dark brocade seems soft and alluring, but it is contrasted by the top’s strong geometric lines that bring in sudden strength and structure to her look. The design courts earlier periods of elegance while the colour palette of strong gem tones links this piece of luxury well within the goth spectrum. This is a dress for those who fancy historical vibe within their style, daily or celebration, it is all up to you! There’s a colour-change HUD of twelve colours included with the dress that controls the bodice and the skirt separately, so you’re actually getting a whole pack of dresses at the price of one! The dress is a rigged mesh item that moves with your avatar. It comes in seven sizes: in addition to the five standard sizes there are also two extra ones: XS+ that provides more generous curves in the top part of base XS and M+ that has more muscles and extra curves than base M. Please try the demo. Please note that the colour-change script makes the dresses appear no-mod in the inventory. This is only because of the script and the dresses themselves are as modifiable as rigged mesh can be: if you wish to tint them, you absolutely can. Constance is a long skirt with some vintage vibe in its long hem and delicate lace fabric. It can easily be turned to a more period roleplay or worn for more official occasions, but it can also be twisted to full gothic flair with the right accessories. The heavy velvet underneath the lace makes it also extremely fitting for wintry weather. There’s a colour-change HUD of twelve colours included with the skirt, so you’re actually getting a whole pack of skirts at the price of one! The skirt is a rigged mesh item that moves with your avatar. It comes in seven sizes: in addition to the five standard sizes there are also two extra ones: XS+ that provides more generous curves in the top part of base XS and M+ that has more muscles and extra curves than base M. Please try the demo before purchasing.